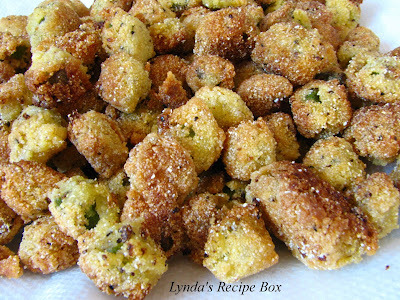 Lynda's Recipe Box: Southern Fried Okra! Last week when I went to the farmers market, I bought some okra. I used to grow it when I had a larger garden and I found myself suddenly craving some of the delicious fried nuggets. This is a dish I don't fix often, but I husband and I do love it. We've just cut down on fried foods; however, I do use okra in some soups that I make in the cooler months. 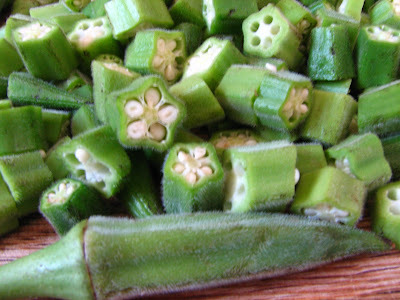 If you've ever cut up some okra, you have found that it's rather, well, slimy on the inside! But this so called slime is what naturally thickens gumbo dishes and it works so well in my vegetable soup too. But some people can't get past this fact, so they don't give okra a chance! But it's delicious and has it's place in our kitchens. To begin, wash it well and dry with paper towels. The okra pods should be no more than 4 inches long or so, or it will be tougher. Slice each pod into 1/2 inch pieces and drop into a bowl of buttermilk. With a slotted spoon, spoon out the okra and add to a bowl of cornmeal. Stir around with a fork and remove okra to a skillet and fry til golden. Drain on paper towels. Let okra cool a minute, them pop in your mouth and eat these crunchy bits of goodness! 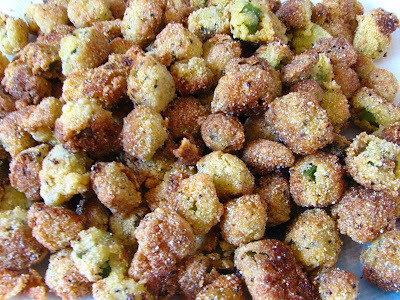 Did I mention that Fried Okra is very addictive? Really, it's more addictive than potato chips and yes, it is a vegetable, so I'll continue to fry them up, just not as often as I would like. If you haven't tried them, you need to! Wash okra and lay on paper towels to dry. Slice okra into about 1/2 inch slices. In a large bowl, add the buttermilk. In another bowl add the cornmeal, salt and pepper. Place sliced okra into the bowl with the buttermilk. Stir well to coat the okra. With a slotted spoon, transfer the okra to the bowl which contains the cornmeal, salt and pepper. You will need to do this in 2-3 batches. In a large skillet heat some oil, I use canola, over medium heat. I like the oil to be about 1/2 inch deep. When oil is hot, take a different slotted spoon and spoon out the cornmeal covered okra and shake it to loosen excess cornmeal, and then put into the hot oil. Let it fry for a few minutes, then stir around with a fork. It cooks fairly quickly so when all sides are golden, remove okra to a paper towel lined plate. 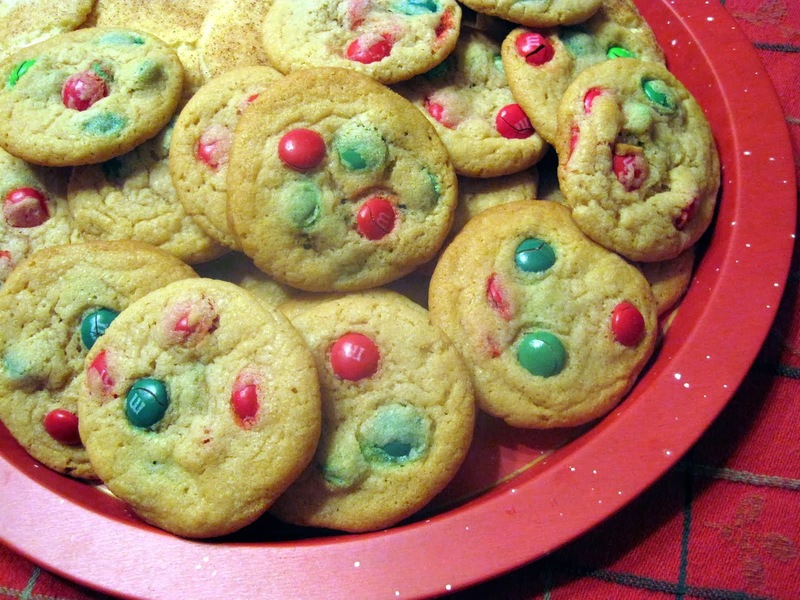 You may have to do this in 2 batches. 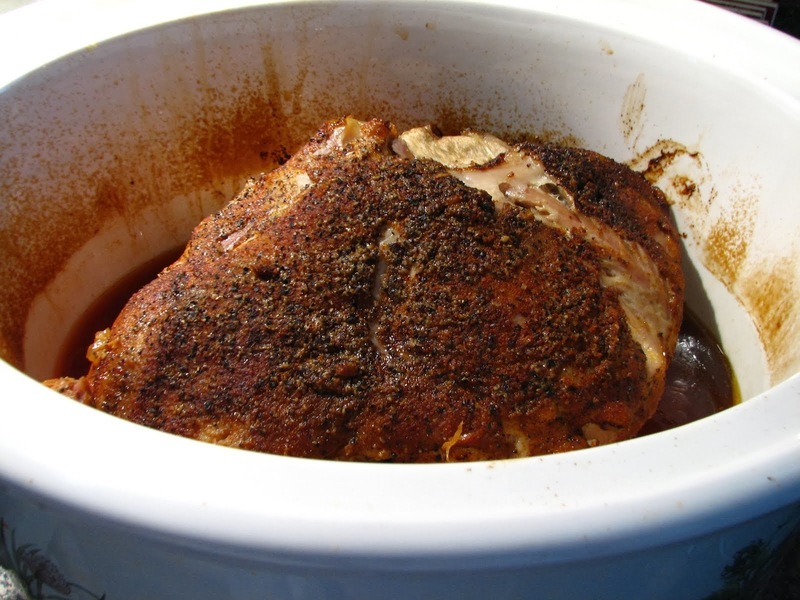 You may also use a deep fryer if you have one. Serve immediately and enjoy! One note: I use less salt than a lot of people, so you may need to adjust the amount of salt in this recipe. If it's rather bland, then up the salt! Are you an okra lover, or an okra hater? 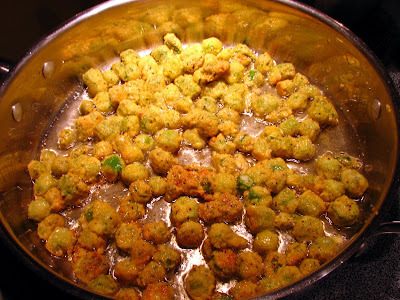 I love fried okra, but haven't had it for a very long time. Now I'm craving it thanks to your post! I learned a ton about okra from this post. I've never tried them. I'll have to look for them at the farmers market! Ive never tried okra before! This recipe sounds great! I haven't had okra since college - this looks really tasty. I love okra, but have never eaten it fried before. I'll have to try this. Okra is my favorite veggie but I've never tried it this way! it was always with soup. 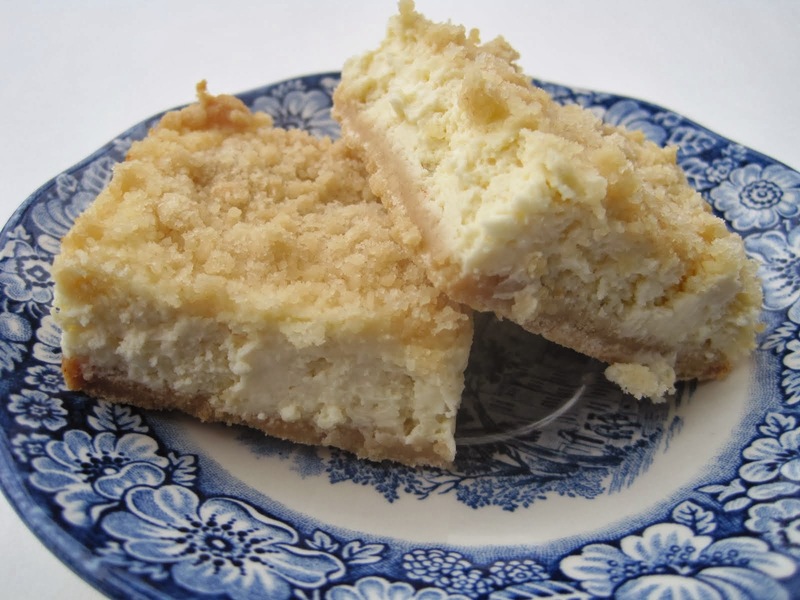 I'll try this one as soon as I can find myself some cornmeal. bless your heart, lynda! i’m so glad you posted this—okra simply doesn’t get the recognition it deserves. i happen to think that there aren’t too many things out there superior to fried okra, and yours looks perfect. I dont think I have eaten Okra ever, but my husband is from the south so I will have to make it for him, it looks delish for sure! I have several family members who would be drooling if I put this on the table! Looks amazing! I have never tried fried okra...only ever had them stirfried. These look and sound amazing! Must be trying these little babies! Lynda, I'm sorry to say I'm an okra hater. It's not the slime. I just don't appreciate the taste. My sister loves it and uses it all the time. Linda, I hope you know I really like you but I really dislike okra LOL!!! Wouldn't stop me from saying you did a great job with it though. I have never tried okra before, I have to admit - I am a little scared of the mucous that everyone talks about.